Portuguese Whitework – Book Give-Away! At the end of last week, we took an up-close, personal look at Portuguese Whitework: Bullion Embroidery from Guimarães by Yvette Stanton. Today, because I know you’re just dying to add this book to your needlework library, it’s time for a give-away! 1. Leave a comment below, on this article, on the website. You can follow this link to go directly to the comment form. Please do not send comments via e-mail (in reply, for example, to the daily newsletter) or on other articles on the website. Just follow this link and you’ll go right to the correct comment form. What appeals to you most about the book – are you attracted by the style of the embroidery, the projects included in the book, or by the instruction? Or is it a combination of everything about the book that appeals? 3. Please make sure you leave a recognizable name with your comment, either in the comment area or on the line for “name” on the comment form. For example, if your name happens to be Mary, there are lots of Marys out there, so you might sign “Mary in Ohio” or something along those lines. 4. The give-away closes on Friday, May 11th, at 5:00 am (CDT in Kansas, USA), and, after choosing via random drawing, the winner will be announced on Friday morning. You’ll have to check back on Friday to see if you’ve won, so that you can contact me with your mailing address. That’s all there is to it! So if you’d like a chance to land your own copy of Portuguese Whitework, do leave a comment below, before Friday morning! And who knows? By next week, you could have a beautiful new book to add to your needlework library and to inspire you with gorgeous projects for years to come! The give-away is now over – thanks for participating! July 22, 2014 Sardinian Knotted Embroidery – A Give-Away! The book looks great, can’t wait to buy it. But what I think is brilliant is the fact it seems to be mainly bullion knots. Thanks for the lovely give away, Mary BUT I was so taken with your write up that I already ordered it! So, don’t enter my name … just wanted to say hi! I love Yvette’s books, and I LOVE your news every morning. Hope the medallion is coming along splendidly. I would just love that book I love all forms of white work it just looks so clean and nice. The book looks good. This book is beautiful! I want it because everything about it appeals to me. I love the look Portugese Whitework and Mary’s review has me chomping at the bit to get a copy. Thank you for opportunity to win it! I love this book! I am just learning to do other kinds of embroidery and I would love to have this in my collection! I have Portuguese ancestry, but did not know that Guimarães had a particular type of white embroidery with bullions. I have a couple of embroidered tablecloths bought in Portugal by my grandmother many years ago, as well as some embroidered tea towels. I would love to have a look at this book, and the history aspect interests me very much. I’m intrigued by the technique and love the projects. For me, its a combination. I will definitely be picking up this book if I don’t win! I think the combination of the Bullion Knots and Whitework is lovely. The designs seem bold and elegant at the same time. I also like the designs done in colored threads. The designs seem very accessible as the instructions look good. I would love to try this type of stitchery. I love whitework embroidery, and I find it’s really interesting there’s a new and different one about Portuguese whitework (sometimes forgotten). I believe whitework is the loveliest form of embroidery. (I must have spent a good half hour at the museum in Williamsburg gazing at and admiring the white work on display there.) I completed my first piece of drawn thread embroidery last year. Because the book combines both types of embroidery, I would dearly love to have it so that I could do one–or more–of its lovely projects. And I know I’ll spend hours reading the book cover to cover for the sheer enjoyment. The photos you showed of the directions made it look really easy to follow which is such a help when you’re trying to learn a new technique on your own. The projects looked incredible, it would be fun to try some of these as well. Overall, the book looks like great eye candy!! Dear Mary, I hadn’t tried a bullion knot until recently on a jacobean piece i was completing finishing. I love how uniform and neat they look but the way in which i used them was very boring. Wow, how inspiring this book is with the way Yvette has used these knots in so many ways. If i was to own this book the first thing i would try is the biscornu pin cushions, they look so fun to make. thanks Mary for the chance to win this beautiful book. I’d love to win this book for a few different reasons. First of all I have always loved whitework. I love the laciness of the finished project and the detail involed to make the stitches/designs stand out on the white fabric. This book is intriguing to me because of the small applications/projects. I love to dabble in many types of needlework so large projects are not practical. I also work full time and small projects provide a way to make hand-made gifts which I prefer sharing with close friends and family. I love the picture with the blue flowers on the white background and the little bag shown on the same page. These are projects I could actually complete while perfecting the stitches and learning the technique. I have always wanted to try my hand at this. A friend gave me a small piece of white work from Portugal as a present some years ago. It is beautiful and I think this book really shows it well with clear instructions, projects and details. I’d just love to win a copy of this book to start me on the road. Hi Mary – What an exquisite book. Yvette is a wonderful embroiderer and her books without doubt are one of the best instructional books on the market. Her knowledge and research done in this book is excellent and the book would be a wonderful addition to any home library. I like her diagrams and projects from beginner to advance, thus catering for all levels of embroiderer. This I would love and cherish in my library. As a member of EGA I have taken numerous cultural needlearts classes. Until this time, my favorites were Blackwork and Ukaranian Embroidery. I love geometric designs in bold primary colors! I would love to expand my knowledge/experience with “Portuguese Whitework: Bullion Embroidery from Guimarães”. Please consider me for your drawing. This Portuguese White work looks amazing! It is unlike anything I have ever done before! One tends to get so bound down in certain techniques and materials, so this book would be a wonderful motivation for a very bored and unstimulated embriderer in sunny South Africa!! Je suis très attirée par le style de broderie ,par les projets du livre,et surtout j’adore la broderie blanche et je suis très curieuse des techniques en broderie. J’ai dèja le livre d’Yvette sur le moutnmellick et jai aimé car très bien expliqué et c’est vrai que en France les livres comme celui si ne sont pas facile à trouver. c’est pour cela que je vous remercie de nous faire partager ces jolies broderies. I absolutely love the look of all white needlework. It has a sheen and show up the intricate detail of all the stitches. I love the antique looking nature of whitework. It always looks so delicate. This style of work looks so beautiful. I am not good at Bullion, I would really like to improve my skills, try a different type of embroidery, learning from a lady who shares her expertice so well. I have been longing to learn how to do whitework and drawn thread work! Your review of this book makes it sound like just what I need to motivate this beginner to try by explaining how to work it in a step-by-step manner. I love the white on white dimensional look of this embroidery technique. So Lovely! It inspires many ideas for using this stitch in my quilt pattern designs. A love for all these wonderful embroidery stitches has been growing in me to the point that I believe it is time to begin putting needle to cloth to try it for myself rather than just admiring your wonderful work. Thanks so much for this opportunity to possibly win this book. This book is awesome. I would love to learn how to do this type of needle work. It reminds me of the doilies, and covers for the back and arms of chairs in the days gone by. The book is presented so one can easily learn. Nice photos and projects to be made by all. Thank you. A friend does several types of white work and soon will be leading an EGA group correspondence class in Schwalm embroidery. She has several books in her collection and this would be a nice addition. Since being introduced to your website, I have been given many opportunities to try new projects. While considered to be a determined beginner, this kind of stitching appeals to me. The white work seems so pure and elegant and from yesteryear which is where I think I really belong. To have this book would open that eara to me and I know I would embark upon those projects with great enthusiam. Surely am happy to be a possible winner on this one. Thanks for this wonderful opportunity and sharing all that you do. Lovely giveaway.. Loved the embroidery style, bullions and was so attracted by the various projects that was detailed in the book. When I read your review I had decided I need to try some of them.. Hope I am able to fulfill it! Thank you for one more beautiful book..
What I love more about the book is the style of the embroidery. I am follower of yvette’s blog and loved her works. I have always been interested in ethnic based embroideery from Hardanger to Ukranian and anythin in between. The Portuguese work fits right in with that. This book with both instructions and projects looks fascinating. I’ve enjoyed Hardanger and drawn thread work, and this looks so crisp and clean! The clear instructions are just what I would need to begin. Thanks for your review and for this opportunity. I just love the look of the whitework. I’m not sure how good I’ll be at the bullions but a small project to start would be fun. Maybe by then I’ll have the hang of it! Wow! Have never seen this type of embroidery and would love to try it. Love the white on white – so crisp and clean! I would just love to win this book. Thanks for the giveaways – your site is always so informative and helpful to me – thanks for ALL you do! I would love to have this book because of the style of embroidery and the projects. I’m not accomplished at embroidery, but I think I could manage this and I love the fact that there are very small projects as well as large impressive ones in the book so that I could work my way up to the more impressive ones. I just LOVE white work embroidery and love Yvette’s books. Her instructions are so clear & the projects SO BEAUTIFUL. As I’ve told you earlier, I’m working through her Mountmellick book right now and this was on the cards for next year but nothing like winning it. Hope I’m lucky this time…because I really really REALLY would love to own this book. The book appeals to me for several reasons…..I’m drawn to it because I love white work, and a combination of the designs, projects and Yvette’s fantastic instructions and knowledge of the technique & its history is unbeatable! OMG this is stunning. Would love a chance to win! Knowing Stanton’s work is enough for me to seriously want to add this book to my collection. I’m sure her instruction will improve my bullion knots and her projects are always drool-worthy. I had an old white linen blouse that was tattered. I loved this blouse. I decided to try and mend it using white floss. I became so intrigued by white on white that I’ve started to learn portugese whitework. I hope to win this book to learn more! Thanks for the drawing! Hi Mary! What a wondeful giveaway! What appeals to me most is the bullions! I love the look of them, and would like to work on them! I’ve only done them once before, and like the way they look. Need to practice more! Thanks for the chance to win such a fabulous resource! It is my frist time try this. my English is not too good, I live in Israel love all kind of neddlework but this one is amaizing i never saw such a nice way to use the bulion stitch. i konw the writer she have very good book, unfortently we can’t buy it in Israel we allways need to bay neddlework stuff from Europe or USA . I love this Portuguese Whitework since i love the best white work like pulled trhead and so on. I have been doing hardanger for over twenty years, and feel an affinity for many types of whitework. You can really see how they’re related from one area to the next. The Portuguese whitework in this book is truly stunning and I’d love to add it to my repertoire. Additionally, the directions look amazing. Thank you so much for the time you spend on this blog sharing your talents for stitching, writing and teaching. You have a passion for all three, and it really shows. Thank you for putting together such a fantastic book! I’ve changed my home page so that your book comes up every time my husband logs on. Think he’ll get the hint? I’ve always wanted to do more whitework and make some of my own heirlooms to pass to my daughter. I love how the book gives the history of the art which makes our craft a lot more interesting than just putting stitches into fabric. How beautiful if the work, I have never seen it before. I love white on white and some of those designs look really wonderful. It would be interesting to know why they did white work and what thread was used originally. It would be the most welcome addition to my home. Oh, Mary, what a gorgeous looking book. I’ve often looked at whitework as something I’d like to try. Portuguese Whitework looks inspiring! You offer such wonderful opportunities to try new things. Thank You! I would love to have this book. It is so thorough in providing a history, instructions on the stitches and projects that range in abilities. What I like the most is that it is well illustrated with examples, techniques and projects. I am a visual person and it is easier for me to pick up techniques from good illustrated examples. I have always loved whitework but had no idea of what is out there. Your website and daily blog educational as well as encouraging. This book will be on my wish list. Thank you for offering this book as a giveaway. The designs look beautiful. Thanks, too, for consistently putting out one of the very best embroidery blogs! For me, all three aspects of this book appeal! The projects look gorgeous, and I have never done this form of embroidery, so the novelty is exciting. Mostly, I would love to own this book so that I could make some Portuguese embroidery for my dear neighbours who are themselves from Portugal and have shown my family such kindness over the years. Thank you for this give away! Ho già altri libri di Yvette e so che sarà sicuramente curato nei dettagli. E’ una nuova forma di Whitework che io non conosco e questa sarebbe proprio una bella occasione. Ciao. Having read and reread last weeks article on the book and doing a lot of whitework myself I would very much like to add it to my library. The other reason is that she includes the history as well which to me is very much a part of any type of embroidery especially whitework. The book has excellent photo’s as well as instructions. My Mom did whitework before I was born and I have been facinated by it ever since. I now own a small piece that she apparently did. And so this book would be a good starter for me as I have never found anyone else who has done this work to teach me or who is even doing it in my world here in the North Georgia mountain area. Thank you, Mary, for bringing us into the world of old and new embroidery. What a beautiful book. I have tried white work in the past, and loved it. What a joy to own a book devoted to nothing but. Thanks for the chance to have this book in my collection. Hi Mary, I’m checking amazon uk everyday because that book is not arrived yet in Europe. I simply love to embroider and ajour and hardanger are my favourite points. I didn’t know this kind of embroider so I’m so curious about Portuguese whitework. I follow your newsletters and your medaillon look so beatiful. I hope to get that book. Love this! Who doesn’t love those needlework bars and cute petals! I would use this style to cover everything that is white! This book is fabulous. Just the cover makes me want it!! I’m such an avid stitcher of hardanger and whitework that this book would be a perfect gift for me. I’m always looking for new ideas and techniques to challenge my Needkework mind. Thank you for giving me this opportunity to win this wonderful book. This is the type of book which I love, because it has clear instructions. For people like me who don’t have the opportunity to be “instructed”, having access to this type of material makes life easier. The Portuguese Whitework is perfect for placematts and tablecloths, which are my favorite. I hope I will be the lucky one. Thanks for your website. Hi Salvador, You have such a portuguese name… where are you from? just out of curiosity of course. I love the cover! This is such a lovely piece. Would love to see more and learn how to do this! Thanks so much for the chance! What’s not to like about this book? The projects are beautiful, the style of this stitching is amazing and from what I’ve seen of the stitching instructions, they are clear and easy to follow. I have a feeling that this would be an amazing teaching aide. I thought I pretty much knew every style of stitching out there after all these years…but here’s one I haven’t researched before. Love the pictures of the projects! Love doing whitework, but haven’t tried this particular branch of the whitework family–so this would be an excellent way to get into it–especially after visiting her website and drooling . . .
BEAUTIFUL ! This is the kind of book I need. I have done all types of embroidery since I was a little girl but this one is unknown to me. And I am ready to give it a try. I have seen your medallion project take form every day. What an enthusiastic teacher you are ! Bravo ! After reading your review of this book, I can see that I NEED this book. The designs are lovely and the instructions appear to be very clear. The sampler project really appeals to me as do all samplers! Thanks for the chance to win this book. I have 3 of Yvette’s other books, so I know how good they are. This whitework looks absolutely beautiful. I would love to try it. Well! It’s easy: whitework is my actual love and job. I really want to become expert in all branches of white work and, I confess, before your articole I’ve never heard about Portuguese whitework. So thank you. But if I could also have the book… Wow! I love bullions and I’d really like to learn how to do all that open work. This but is a must have. I never heard of Portuguese embroidery before, but I am fascinated with all white work, and would like to learn more about it and how to do it. Thanks you for all you do for furthering hand embroidery. I have loved bullion knots for a long, long time, so to discover there is a type of regional embroidery that uses them as much as this is very exciting. Yvette does such a wonderful job researching for her books, that I can’t wait to see the book for real. Oh, I would so love to have this beautiful book. I do hardanger, and love the look of the openwork and filling stitches. This is similar. The projects in the book are beautiful, and I would love to learn this type of embroidery too. This is such a beautiful book that I would love to own it! The projects and instruction have great appeal to me. Thanks! I like the book because I would like the opportunity to try a new open embroidery like this. and from your description of the book Yvette’s has very good stitch explanation which is what I need. The projects seems very interesting for some summer projects! Love your newsletter! I have shared it with many of my “embroidery friends”. Beautiful Bullion Embroidery book!! Love working with BDE and any book would help working with Bullions. Hi Mary, The white work is really beautiful and I would love to be able to make a perfect bullion stitch. The book looks lovely and thanks for sponsoring this give away. I appreciate all the work you must do in order to keep us informed about the various types of needlework. I have several pieces of White Work from my Grandmother and would love to learn how to do it for my future generations. I love the way this book lays out the instructions. It looks like it will be a great way to learn. The doors to embroidery and hand work land you have definitely opened for me. Thank you. The thing I like most about this book is the fact that I can learn something new and maybe, just maybe I can master the art of the bullion stitch. What a pleasure that would be. From what I have seen of the book, the diagrams are excellent. What a way to learn. Thanks for providing us all with this opportunity. What a give-away!! I adore white-on-white embroidery, and to combine drawn thread with surface embroidery to me, is the height of everything I love about our world. I love white on white and I’m finally learning to do bullion knots so I would love to win the book. A technique I have ot tried, would be great to read about and try. Thanks for yet another giveaway Mary! Knowing that I live only 50km away from Guimarães made me very proud that my country was referenced in your blog. I love this book and as I am learning embroidery this would be a great book to have around. If I don’t win I will defenitelly buy this one. Oh PLEASE enter me in your giveaway! I would love to have this beautiful book :)Thank you for this opportunity! Oh, Mary, I would love to win this book! It appeals to me first because it’s surface embroidery, second because of the drawn thread work (I’ve been wanting to learn this technique) and also because I love white-on-white, and bullion knots. I am intrigued by Portuguese Whitework. I come from a German background and my mother and aunt taught me a very similar style of embroidery. I would love to have this book to improve my very meager knowledge of this embroidery. Thank you so much for the review of the book. If I don’t win it, I am putting it on my wishlist for Christmas! Since I am of Norwegian stock, I have always regarded Hardanger embroidery close to my heart. I love doing it…perhaps because of the cut-work or the white thread used or a combination of the two. I can see the Schwalm Whitework book as a welcome addition to my ever-growing library of needlework. It would be much like a new recipe for me. The basic ingredients are the same but in some ways it will be completely different from any of my other pieces of stitchery. My library would be a good home for this lovely book. The book looks wonderful and I particularly love the white on white. I always bring a project with me on holiday, and this year it is going to be Portuguese white work. Thank you for your very inspiring newsletter, I enjoy it with my coffee every morning. Mary, I think that whitework is just so beautiful and this is really something I would like to know more about. This book seems like a wounderful way to learn. The projects that you have shown us from the book are inspiring. I have other books by Yvette Stanton and they are so very clear. White embroidery appeals to me. I love all kinds of brodery. Most of all such fine one colour brodery. Blue or white I love the most. After many years of no handwork because of no time. I’m glad that I can make time for some handwork. The book is so fine and makes me smile because all the work that is shown is so beautiful. If I have not the chance to win this book I will go and look in the bookstores in Leuven (Belgium)to find the book. This website Needle ‘n tread is so refined. Thank you very much. I love the look of this technique. I find it fascinating and I’d love to try some of the projects with my wonderful Brazilian threads! I like hardanger, and this book seems to contain something similar to it. Another great giveaway…how do you do it? The white work in this book is absolutely beautiful and something I would like to try. I also love the projects, including the small ornaments which should be a quick and easy way to start. Thanks again for doing this give away! The project on the cover is soooo gorgeous that I will have to make it. If I don’t win I will have to buy it. Since I planning a trip to Spain and Portugal in 2013, the info inside the book will get my mind attuned to Portuguese culture. This book looks great! I love the projects and the instructions look very detailed and clear. The finished work is just wonderful. I will be buying ths book if I don’t win. This would be a great gift to receive. I am trying to get the supplies together to start a whitework project. This would be a wonderful help. Besides that, having my birthday last week and Mothers day this week and a 40yr. Anniversary at the end of the month this would be a gift my family would never buy. I have not had a chance to view this book, however, Ms. Stanton’s reputation as an author is outstanding. I have recently purchased Left-Handed Embroiderer’s Companion, and I am impressed by the illustrations, the text explanations and the comprehensiveness. I would expect nothing less than similar care and pride in this production. I am also looking forward to the project ideas, as this kind of work is lovely. The cover is beautiful. Thank you for the opportunity to win a drawing for this treasure. Whitework is beautiful for its for its striking elegance. I love seeing the creativity that flows from a monochrome palate and and limited number of stitches. I’d love to learn how to use the bullion knot to its greatest effect. Thank you for offering this giveaway. This book on this type of embroidery, is the most beautiful I have seen! I look forward to another adventure in the stiching world. For months I’ve been following Yvette’s blog as she created this book. Now that you have shown selected pages on Needle ‘n’ Thread, I can see that it’s even better than I’d hoped. The first thing that attracts me is her use of color throughout to display the whitework. Second, the thorough step-by-step instructions for a technique I would love to learn. Of course the main reason I want this book is to learn the technique. Thank you for sharing this review as well as the opportunity to win a copy of the book. Tantos pelos projetos como pelos ensinamentos…. Valerá a pena por tudo!!!!! For many projects such as the teachings …. Is it worth for everything!! What a wonderful giveaway! I’ve been coveting this book since first I read about it. The pictures are so attractive and inspiring. And I love the combination of drawn-work with surface work. And well, bullions are just plain awesome. Please enter me in the draw. And thanks again for your terrific website and generous spirit. I would love to win this book as it is like nothing I have seen before and would love to give it a try, the instructions and pictures look wonderful. I love your website and just completed a monogram I found from visiting your sight. It was a big hit at the wedding of my granddaughter. I am always looking to broaden my hand embroidery techniques and books such as this are a great aid to me. I am amazed at all the tips and stitches I have been learning. It would be a privilege to add this book to my small embroidery collection. I’m would like to learn the Whitework Embroidery from Guimara`es as it looks so beautiful. I can see from the illustrations it would take some practice and would be fun and challening.This book would be the perfect teaching tool and a treasure to own. I love making bullions, Mary! It’s one of my favorite stitches. Just the cover of the book alone is enough to make me drool. Thanks! Yes, this book is on my “must have” list. I was excited about it from the first time I heard about it because (a) it is about embroidery!, (b) it is ethnic embroidery, (c) it is beautiful, and (d) I became a big fan of Yvette as I worked my way through her Ukranian Embroidery book. It was most excellent — how she goes through the process thoroughly AND in pictures. OH, I hope I win!!! I love white work and have long been a fan of Portuguese embroidery so I was thrilled when I saw this book review. I’m most excited about the great photography and gaining a better understanding of the elements that go into this style of embroidery, the projects and step by step instructions are an added plus. I look forward to adding this to my library one way or another but winning a copy would certainly be nice! I have started making a portugese-style crazy quilt and would love to add some authentic white work to it. Your blog has been a great inspiration to me as I learn new embroidery skills. Your medallion is truly amazing! I inherited some white work done by my grandmother and I thought it would be fun to try to duplicate the work but had no idea how to start. It looks as if the book’s detailed instructions would answer most, if not all, of my questions. Very interested in doing the techniques using the projects ect. I have always wanted to try this type of needlework. Have looked at the book at other places and still want it! Thank you Mary for offering this book as a giveaway…Recently, I have become fascinated with any of the embroidery techniques from the Iberian Peninsula and the Mediterranean basin. This is a new technique for me, about which I would love to learn more. I would love to win this book. I love learning new techniques and this book appears to have very clear instruction and the patterns are a bonus! The book itself also looks to be inspirational. I love whitework! It’s so delicate and so beautiful. OK, I’ve never tried it. I’ve tried just about everything else in embroidery, but never whitework. It intimidates me. I have tried bullion knots. The outcome of that was bullion knots 1 — Barbara 0. Can this book help even me? I have no idea how “pulled thread” is done and I do enjoy just using a single color (seems to go faster than multi colors)so I’d like to try a project. Thanks for the give-away. This book is such beautiful eye candy! Going beyond that, I tried doing bouillon work before and enjoyed it, but didn’t pursue it. I think this book would give me more structure with its projects — easy and more complicated — and with the instructions. I liked the photos included in the instructions as I am a visual learner. Thanks for the opportunity to enter the give-away. This book intriques me as I have never done this technique before. I like to do non-counted forms of embroidery and this book would spur me on to try Portuguese Whitework. I have been “playing” with embroidery Since my mother taught me when I was 10. I’m now 70 and have decided since I am now retired to get “serious” and try something that challenges me. This book looks to have very explicit instructions as well as beautiful pictures. I woukd love to own this book so I can learn how and to be able to pass the skill on to my randdaughters. Thanks for you website. I look forward to my daily newdletter. I have always loved whitework, although I have never tried the technique. Not yet anyway! In particular, I love the use of bullion knots for building up relief contrasted with the drawn thread work. Beautiful. Oh, I am dying to get my hands on this book, I’ve seen Yvette’s Mountmellick book (which is high on my want to have list) and saw how excellent her instructions are. I am a keen embroiderer of whitework, am currently into Punto Antico and would love to continue with the Portugese bullion knots and drawn thread. Thanks for a great blog and yet another give away! Portugese embroidery is something I have yet to try and this book seems to have a lot of great ideas and all the information to start discovering this art form. Would love to try my hand at it and win this book! You’ve named all my stitching passions (whitework, drawn thread and regional embroidery techniques). The publication’s “presentation” is eye-catching to say the least. Hardanger projects have been my favorites for some time. This technique looks equally as intriguing. I must say everything about this book appeals to me. The designs are especially beautiful and I’m sure after doing a project you will become very proficient in bullions! Would love to win this book Mary. This, to me, would be such a challenge. Love to read about your medallion every day. It will be beautiful. Hope I am a “winner”. I like everything about the book and would like to incorporate the techniques into my ecclesiastical embroidery. Thanks. It looks like a wonderful book. I have not tried this technique. The projects displayed in the book appear to give you the opportunity to start small and then develop some wonderful examples.The book is on my wish list! I would love this book because I have only done cross stitch and am feeling the need to branch out. I had never heard of Portugese Whitework and am very impressed with this. I love the pictures and am sure that the instructions will be clear enough for even a newbie like me to follow. Just a glance at the gorgeous photo on front of this book and I know, already, how versatile, as well as beautiful, the skills and techniques within will prove to be. My mind is already bursting with inspiration, from the formal and elegant to the informal and quirky. Love that the book has historical content, what looks to be a really nice technique section,patterns AND additional information. It’s jam-packed and I can’t wait to add it to my library. Thanks Mary! Your review of this gorgeous work inspired me to start a project based on the Hungarian Drawn Thread Embroidery book you reviewed recently (and I bought!). It’s progressing nicely and I’m having fun. I like the projects, and especially appreciate the instructions. I have struggled some with bullion knots and still feel a bit intimidated by them. I would love to have this book! I looked it up and couldn’t justify the cost (having already bought so many technique books. . . .) but ooh la la it is an excellent thing. After reading your review, I put this book on my wish list. I really appreciate the number of small projects that allow one to practice but still result in a finished item. Beautiful book! I have just recently learned drawn thread embroidery and feel this could be a natural progression in my ever growing stitch repretoir, plus the projects are so neat! I love whitework so everything about Yvette’s book is a magnet, especially the history and clear instructions of the technique. My fingers and toes are still firmly crossed for the 15th May. I enjoy to see the style of the whitework. It has a special look comparing to other sort of whitework I have seen. It seems to be an ambithious book. Portugese whitework is entirely new to me. How lovely can any needlework be? This is certainly tops in the list. Totally lovely and I would love to start learning how to make items using these skills. Thanks for all of the lovely things that we find through your newsletter. I had no idea many of these types of needlework existed. Hi Mary; I enjoy your website & visit it often. Thanks. Keep up the good work. I am a fan of whitework. Have taken two courses, pleased with results, but much more to learn. I’m intrigued with the Portugese Whitework. I am working on a sampler (similar to one in the book) outlined with a peahole border / have 42 squares to fill. Some Portugese motifs would work wonderfully. I love white on white work. I have never ventured the pulled thread before but up for new challenges. I think this book is beautiful and instructions look like it leaves no room for questions with so much detail. I love books on techniques that I have tried yet. Whitework in it’s many forms has always been interesting to me because of the clean tone-on-tone embroidery. I can’t wait to purchase this book, it looks wonderful. I love this book! I love whitework and I am looking forward to working on some this year. I especially love the sampler in this book. this book is amazing, judging from your review, I would love to learn this technique..I have been stitching for a long time, but have just this past year started adding different styles of embroidery and I think this would be a wonderful book to teach me a new style..thanks for the giveaway…you are generous as always…Rebecca Keith in VA.
What do I like best? That it is a new technique (for me, anyway!) and I always like to broaden my knowledge of stitching. It is fun to learn new techniques and then find ways to incorporate them into projects! I think this would be a great book to have because I am beginning to make linens for my daughter someday when she moves out on her own and would love to use this book for inspiration and for instruction on how to do this type of embroidery. The combination of style, instructions and projects about a lovely form of embroidery is the PERFECT combination! The idea that we can help keep a little known historical form of needlework alive in some small way is a powerful incentive for me, whether it’s Portuguese Whitework, Hardanger or other forms of embroidery. Hope to see some Portuguese Whitework in person next spring when we are considering a trip to Portugal … still to be decided. As always, Mary, THANK YOU for your generosity! I love the simplicity and elegance of white on white. I think it creates stunning linens and clothing. I’d love this book both for the inspiration and designs. I love learning all kinds of stitching that I see but do not know how to do. The would be a great addition to my stitching and quilting library. Thank you for this lovely give away offer. I would love to get this for all the reasons. I love the look of drawn thread work, I’ve done a lot of Hardanger and would love to give this a try. Oh my, a chance to win this book… I love collecting linens, especially ones I can put on my dressor. This technique is so intriguing. I have a friend who is of Portuguese descent and I would love to make her one of the little projects in the book. The instructions look like something that would be easily followed and I can do a boullion… I’d just like to become an expert. Again Mary, thank you for sharing your book reports (cause I’ll buy this one if I don’t win it) and for keeping us enthusiastic about our stitching! It’s sunny in Washington State today–yippee! Hope you have a great week. I always like learning new techniques. They then get incorporated into my own style. Thanks for the giveaway. I have never seen this embroidery before. It is beautiful. I would love to learn to do this. I trust your comments on books so would love to have this book in my library. What a fabulous opportunity! Everything about this book appeals to me. I love the whitework, love the bullions and love the fact that there are smaller scale projects. I’m working on a large project now, so smaller things would be perfect to do here and there as a break. Thanks for offering the chance to win this book and wish me luck! This would be a wonderful addition to my library. I don’t have anything about Portuguese embroidery. I have done Moutnmellnick Embroidery and done bullions, but never achieved such an elegant look. I hope this time I will be a winner. Thanks Mary. The whitework book looks awesome. Some of the stitches look like something I have done and others that I could do, therefore, it looks DOABLE. Also, a nice learning opportunity to enhance my stitching knowledge. What appeals me about the book is a combination of everything. I’m Portuguese, lover of embroidery and would be wonderful if I was the happy winner! Win was a sort of early birthday present. If I do not win, the book will certainly be part of my wish list. Thanks for the sharing of knowledge and dissemination of the art of embroidery. I like white. I like white on white embroidery and do many Christening gowns with white embroidery. This book is just lovely and has techniques I have never seen or know about. I also am program chair for the Napa Needlers and like to have something new for the ladies to learn and this would be perfect. I would love to have this book. I currently do Portuguese stitch for rugs and I also do Hardanger. I think the Portuguese white work would be another type of ethnic embroidery that I would like. I would like to combine Hardanger and Portuguese white work to see just how they would work together. The beauty of whitework is the embroidery itself, the stitches. It doesn’t depend on color or metallic threads to attract. The purity of white against white, twisted, curved, raised creates its own appeal. Add drawn thread work and I’m hooked. I’ve done whitework with crewel and Hardanger projects. This would be the impetus to try Portuguese. Thank you for your inspiration. I share coffee with you every morning. Beautiful projects, especially the ornaments. I also like how the patterns are presented on separate sheets in the book. Thank you for reviewing books. There hasn’t been one that I wouldn’t love to add to my collection! Since I was a little girl,Portuguese whitework has fascinated me. My grandmother was Portuguese and loved to watch her do her embroidery. I have always wanted to learn more about the technique and this book looks like a perfect way for me to do this. I especially like the idea of telling the history of the region it comes from. Je suis française et mon mari portugais. Malheureusement, il ne connait pas la broderie. J’aimerais lui faire plaisir en utilisant un modèle et une technique qui lui rappelle son pays. Merci pour votre merveilleux site et plein d’amour à toutes. What appeals to me about this book is a whole new technique I didn’t even know existed! The cover shot just makes me want to make one! This looks like a very interesting form of embroidery. I adore the bullion stitch. I have never seen Portuguese Bullion Embroidery before. When I was a young girl visiting my Aunt Rose in VT., she would show me her beautiful handwork like that in the book. I loved it but life got busy and she was a long way from my home town. In those days not a lot was available for instruction so I never learned how to do this type of work. Now I am retired and would like to learn. Learning never ends in needlework. I would like the instruction this book offers and would like to give it a whirl! My EGA chapter has a white work group. I have always been entranced by white work and this stitching with its bullions looks like future projects for our group!! I hope I win the book but if I don’t I will buy it sometime in the near future. I love the look of whitework, but haven’t really done any. I think the best part of the Portuguese White Work book is that it has projects with step by step instructions. That’s what I think makes a useful book. I would love to win this book because I like to do boullions and the projects look wonderful. This book on Whitework appeals to me because it looks to be so very clear. The work has a geometric balance and cleanliness that I would like to learn. I would start with the square mat, but probably not make cupcakes. Part of the appeal of this book is that the techniques I can see seem to be similar to techniques in my families heirloom embroideries (which unfortunately have little background information to them in terms of who stitched them, origins etc), and I love the idea of making my own version of family heirlooms so that at least one heirloom item comes with background information! I think I’d make the tablecloth or tablerunner project to match the works my grandmother holds… They scream elegance and fragility, I just can’t go past them! I’m attracted to this book because I love whitework/pulled work/reticella. One tablecloth that I own has some similar work on it and I’d like to see if it really is the same. Plus, this looks easier than reticella, bullions are a snap for me as I’ve been doing them since Grandma taught me as a child. I love the general style overall. It so old and yet so fresh! The texture is alluring, I love the way the patterns rise up from the fabric. I am not intimidated by all the bullions, I think it is a wonderful way to fill an area. Thanks for the chance at this lovely book! I am attracted to white work because it looks so vintage. I love vintage linens. The level of instruction is awesome since it is a new style of embroidery for me. This book looks amazing. The white on white always appeals to me. The stiching looks so delicate. I Love the concept of white work. It just looks clean. Thank you for the chance to win the book. Whitework always reminds me of my Grandmother. Her doily’s, dresser scarves, sofa protectors, table linens were all white made of various laces and embroideries. I would love to learn from this book for the style it uses. We were in Portugal last year which is such a great country to visit. I love whitework and the projects in this book look wonderful. I would love to add this little gem to my currently limited needlework library. I just started building a library and am very selective on what I add to it. I’m only interested in books that I will actually use and projects that I REALLY want to do. This book will be and excellent addition since I love making BIG table clothes and I have not done one in Portuguese Whitework although I have one with some color in it. Portuguese needlework appeals to me due to my heritage and the absolute clean and delicate look of the piece once you’re done with it. Would LOVE a copy of this book!!! I have worked several whitework pieces but have never done Portuguese whitework. I live the look of the bullion so would like to try this type of embroidery. As I live out in the middle of nowhere, I really prize books that have good instructions which can be used in self teaching. is gorgeous! I can’t wait to try it in other solid colors beside white. Even if I’d seen your review with my eyes closed I would have just so loved this book! There’s a kind of enchanted mystery about whitework. It relies on shadows to bring texture and form to light. The same with this book. One gets the feeling that many surprises will surprise. Thanks Yvette and Mary, Cheers, Kath. Kath from Oz, I is! I love this book, I would love to learn how to do white work. The book looks like a great resource for learning. I would love to try out the projects! You are right…I would love to have this book in my collection. it can be found on “My Wish List” in My Favorites folders. I love to know the history of techniques and currently am researching the connection between Islam and black work. I wonder if there is any connection between the history of Moorish Spain and Portugal since they are geographically close. I love the images I am seen from this book on various blogs, too. And unlike many, I like stitching the bullion stitch. I enjoyed the sense of mastery once I got the technique down. I must confess that, when Mary said that the book isn’t available yet in the U.S., I hoped there might be a giveaway because I feel quite desperate to get my hot little hands on this book. Whitework is, by far, my favorite type of embroidery. It’s beautiful, and it’s functional: since it tends to be easy to wash, there’s no reason not to use it to make all sorts of beautiful projects for the home. The fact that several of the projects seem intended for just that reason, I’d love to try these techniques, and fill my home with whitework that’s just a bit different than I usually do. The Portuguese Whitework book is appealing because is it whitework, but it also appears to be a great attempt to revive a traditional, ethnic style of embroidery, that just happens to be gorgeous. The mix of large and small projects is nice as well. Finally, Yvette’s reputation for excellent publications promises another wonderful, beautiful book that will inform the whole needlearts community. I would certainly like this book in my library. I would say it’s the combination that appeals to me. The first thing that catches my eye about any book is the cover and photographs inside. This book has superb eye candy for all! Next, I scan the text to see how clearly the instructions are presented. I want to make an heirloom “drawn thread” type table runner and just learned to do the bullion knots. This looks like an excellent book. Thanks for sharing. What appeals the most to me I think is that it’s whitework. I’m very fond of whitework, I think it looks very elegant. And I’m not scared of bullion knots! Well the short answer is that it is a combination of all three but I think a give-away deserves the full answer. Of, course the projects attract me, for what I have seen they are devine but I know that I would not have the time to make the tablecloth. I already have the Right-handed Embroiderers Companion so I know how good Yvette’s instructions are, that is a big attraction. The biggest attraction for me is the style of embroidery. It is one that I know nothing about yet and I am always keen learn other embroidery techniques, especially one as lovely as Portuguese Whitework. Thanks to you and Yvette for another exciting give-away. I would totally buy this book. I will most certainly be adding this book to my Library! If I do not win it, I will buy it! What drew me to the book was the work and then how the instructions were written. Thank you for the chance at a great give a way! The book’s main attraction in the detailed instruction which would certainly allow one to become a master at this style of embroidery. OK – so I do have to admit I LOVE the projects, too, …and the style of embroidery….and.. what’s not to love about this one? Trying out different styles of embroidery is really fun and interesting and her style of instruction sounds like it will be easy to follow. Thanks Mary for the give away. I like the idea of the smaller embroidery items that would enable me to practise a new stye of embroidery. I know from experience that Yvette’s books have very clear instructions. I have always liked white work but have never tried it. With this book i feel like this is the push i need to do it. Thank you for all the nice give aways you do. I must admit that I was not familiar with this type of bullion embroidery from Guimarães until I read your book review. I simply love all forms of whitework, but I have always been partial to designs employing bullion knots. I really love the way that they “pop” off the fabric. The photos of the projects in this book are so beautiful and I love the idea of experimenting with other colors of thread. The blue and white embroidery gave me lots of ideas! Thank you once again for introducing me to a new type of needlework. Now, if only there were more hours in the day…. Thank you for sharing your wonderful photos and descriptions of this beautiful book Mary. I fell in love with it after reading your post. This style of embroidery immediately brought back memories of my mother and grandmothers tablecloths and linens of the late 50’s and early 60’s. I remember my grandmother having the most crisp, beautiful embroidered linens on her formal dining room table, buffet and even a specially made embroidered linen cover for her “mangle” (a device she used to iron clothing and linens for her family of 8 children! )The photos in this lovely book took me back to that time. I could almost smell and feel the crispness of her freshly pressed linens. I would love to try my hand at recreating some of those lovely items and this book would surely guide me. I love the little ornaments. I think they would be a great way to learn the techniques. Thanks for the give-away opportunity, Mary! The technique is new to me, but looks very interesting. I’d love to give it a try! I’ve used other books by Yvette Stanton and found them very easy to follow, with interesting projects, so I’d love to add another one to my collection. Oh yes! I love the look of the white-on-white. Together along with the cutwork, it is such an elegant look. This looks like a wonderful book. I like white work and have never seen or created such stitches. I would like to have this book available to me so I can incorporate the stitches in my work. Such a wonderful book,I have not attempted the technique in my 67 years of needlework experience.I love everything about this book,especially the instructions as it would be easy to follow and relaxing as all needlework should be.My fingers are crossed as I’m sure all the other contestants are.Thank you for chance to win this treasure.Judy-in-Frenchtown. Everything about this book is wonderful – the instructions, the photos, and the technique itself. I have inherited from my family a set of pillowcases I think is in this style and they are beautiful..
Hello to everybody! I love Yvette Stanton’s books and for me it is a good reason to try to get this one. I can’t wait until it will be available in Europe! The book looks lovely. I would love the instruction and the photos alone would be inspiring. Dear Mary, I have always been enchanted by Whitework. It has such a beautiful look to it. I have always wanted to try it and this book seems like an excellent resource so I guess you could say that everything about the book is appealing. Thank you for offering us a chance to win it. Take care and thank you, also, for sharing your knowledge with us! Dad gave it to me. The illustrations are exquisite, this would be my first book in this category. Thanks for the opportunity to enter. I’m very drawn to this style of needlework and equally excited to see that there’s enough interest in it to warrant a new publication. New books are a great gauge of the health of a subject, and I know all of us out here are doing everything we can along with you to promote embroidery on every front! Thanks for yet another great give away. Everything about the book appeals. The history, the designs, the stitches. I like learning new things and trying new techniques and understanding the history. I love everything that you posted about the book. It is on my “to buy” list. I enjoy doing bullions and was intrigued by what they were doing in the book with this stitch. Thanks for another give-away. I love the style of the embroidery and the instructions. The “texture” in the photos draws me in! Oh, that looks like a lovely book. I’m hoping you pull my name from the hat. Thanks. I would love to win this gorgeous book. I am very attracted to the style and elegance and the bullions. I’d like to try my hand at them, I’ve only made a few bullions in my stitching life. One other thing, my husband is half Portuguese so I’d like to learn this technique and past it on to family members. Technique, and the prospect of really specific, detailed instructions – I’ve been embroidering, off and on, for years, but have just begun to really obsess on fine technique. I don’t do tablecloths a lot (my husband hates them) but we’ll be moving ‘cross-country soon and I’ve promised myself the opportunity to decorate at least ONE room in the new house (not chosen/bought/rented yet) to MY taste, instead of accepting somebody else’s colors for 10 years, and I’m dreaming of whitework curtains. Those floral-in-grid designs would be perfect, not too fussy, informal but not too casual . . . like the garden I want to plant . . . This whitework is so beautiful, and perfect. I would love to be able to reproduce a peice of this whitework. Yvette never ceases to amaze me! Her books are absolutely beautiful. This book would be the first in my library on any white-work technique but I know it would be beloved! I just really started working bullion knots well (at least I think) and seeing the review made me jump! I’d love to own a copy-so if I don’t win I may have to put another charge through book depository! The projects are simply devine and I can only imagine that the instruction is superb, as always! Thank you for your generosity Mary! Since your article about Portuguese Whitework, I have been thinking about it. The designs are bold and crisp, more so than any other whitework I have tried. It has enormous appeal. Should I wait until Christmas and put it on my list or wait and take a chance? I’m taking the chance. This book hits my inspiration points! I will love to start right in making the smaller projects so I can build up to the larger ones or design my own. Thank you for offering it! My mother is 81 years old in a few days and asked for this book for her birthday. Mom has done pretty much every stitch there is to do and she is excited to do some Bullion Embroidery. She would love to receive this book. I love the simplicity of the white on white (that means a lot coming from a color and contrast lover!). I also love the drawn thread technique (I haven’t tried it yet! ), it really adds a extra pretty look to any piece. Thank you Mary and Vetty Creations for the giveaway! What I love about this book is the texture of the stitches done with bullions and drawn thread work. I think the instructions are well done and I like the variety of projects. The sampler gives you the opportunity to try the stitches in another format or with crazy quilting. Thank you for a chance to win a book for our guild library. This book is wonderful, I’m attracted by the style of embroidering,by the patterns, by everything….for me…because I’m Brazilian and cause most part of the handwork we do in Brazil came from Portugal, this book is treasure! I have Yvette Stanton’s Hardanger book which I have used often – so her Whitework is sure to be exciting. I have battled with bullions for ages and would like to get expert advice on just how to make them all perfect everytime – not only sometimes. We cant be sure that we will be able to get a copy in South Africa soon. i started following yvette’s blog just as she began to write, (stitch), this book. it was so much fun watching the progress. i’ve always been a fan of bullion roses. i just enjoy making them. when my granddaughter came along i found some books on bullion animals, faries, and people. they began to show up on the clothes i made for her. so i guess you could say it is deffinatly the bullions that attract me to the portuguese white work. I like the style of the embroidery, and bullions are fun! I read your review of the book and am excited about adding Portugese whitework to my skills. I am passionate about hardanger, moving from there to hedebo, schwalm, Italian drawn thread and think this broadens my international scope of embroidery yet again. Your newsletters are fantastic. I got a good look at this book last weekend at a needlework seminar. The projects included some very pretty designs that seemed quite do-able, and the instructions and diagrams were excellent. I love trying something new and this book looked delicious. Thanks for offering one. Please enter my name in the drawing for this sumptuous book! I fell in love with the elegance of the technique and immediately put the book on my wishlist. I love absolutely everything about this lovely book, the illustrations, pictures, discussion. I would be thrilled to learn this beautiful type of embroidery. Hi Mary – What a beautiful giveway! What appeals? Everything! I love whitework and ethnic work. I currently do some lace and Hardanger. It would be great to learn some southern European embroidery. Thanks again for this fabulous book giveaway. This is one book that is at the top of my ‘to get’ list. Please pick me!! I would give this book a wonderful home. Oh, my, what beautiful needlework. I’m so excited for the the chance to get it. I admit, I had never heard of the Portuguese style of embroidery until your book review the other day – but by the end of your post, you had me drooling over the photos. I love the texture, and the naturalistic patterns! I’ve been experimenting with white work since finding your site and find I really enjoy it. So I would surely learn more from this book. And by the way, just love your site! Ijust love white embroidery. I buy book of white embroidery. I do project of white embroidery. I think I like this kind of embroidery because the beauty of this art is in its simplicity. It look simple but, to be beautiful, it has to be done perfect. I also loved how it can be interpreted (tradition vs comtemporary). As you can read, I just adore whitework. Beautiful book and the techniques look different than many of those that I’ve seen in earlier books. Everything about this book appeals to me. I love to learn new needlework techniques and this one is beautiful. I was recently laid off work and have been using this blessing of time to learn and re-learn some needlework that I have always wanted to, just didn’t have time to. I love that sampler and that might be what I would aim for. Another great giveaway. Yes, I’m interested in the techniques, projects – everything. The small projects look to be a great way to build skills. This book is on my wishlist at Nordic Needle, as a preorder. Next trick will be finding suitable fabric….. Thanks so much for keeping us up to date on new publications! I’ve been waiting for this book to come out, I don’t buy many new books but will definitely get my hands on this one. I love all drawn thread work and the combination with the textural embroidery really appeals to me. I’ve never done any bullion knot embroidery but am keen to give it a go! I have Yvette’s merezhka book and it is excellent. Thank you for reviewing this book, I have been waiting for it to be available. Yvette Stanton’s directions are so easy to follow she gives me the confidence to try any type of needlework. I am currently learning Merezhka from Yvette’s Ukrainian Drawn Thread book. Yvette’s books have clear step by step photos of how to start & finish a thread or a row & she takes you through a learning piece from beginning to end not a lot of books do that. The charts are lovely & clear too. I just love everything about Yvette’s books. I am keeping my fingers & toes crossed. Thank you Ley. I would love to have this book for our guild library because we will be studying various forms of whitework next year in our “Learn a stitch” sessions in the morning and also in afternoon workshops. This book has great instruction and it is a technique that would be new to most of us so that would give us a challenge to learn a new technique. We have many very experienced stitchers in the group but I have never heard anyone mention this technique. Thanks for a great website – I get the daily newsletter but I have used the site for information on specific stitches and I love the book reviews. Beth – north of Kingston ON. Mary – I would love to win this book for many reasons. First, I love the perfect and simple elegance of white work. Secondly, there are several special occasions in the future. I just know there are fabulous gift ideas waiting within these pages! And last but not least – it is just a beautiful book! There could be hours of perusing before a project is even chosen and planned. Yes – definitely, I would love to have this book! I have been thinking of buying this book as I have seen reviews on other websites too and have really liked the embroidery. Thanks for the wonderful chance to win . I love the stitches used and the final outcome of this form of embroidery . This whole book is a bit of an inspiration, don’t you think? I love bullions, though, and the ornaments you highlighted. All around, sounds like a great book! I love whitework. Woud love tohave this book to work some more. The thing that is most appealing to me about this book is first the beautiful style of this type of embroidery work; and secondary is the creative and gorgeous projects. It is the whole book which makes it special for me…Yvette is such an excellent researcher and writer. I would love to be able to try this exquisite Portuguese style of needlework. Thanks for the chance to win this beautifully produced book. This looks like a wonderful book. The combination of everything about the book is appealing. My grandmother loved fine linens of all sorts, table linens, bureau scarves, etc. We still have many of those linens which she would have purchased in the early to mid 1900’s. My Mom tells us that, in those days, there was a traveling salesman who would bring his linens to the house to sell. I have always admired these linens, but assumed that the art of making them was lost. So, I think what appeals to me most about Yvette Stanton’s new book is that it keeps this art alive! What fun it would be to to try my hand at learning this craft. Whitework embroidery of all types represents such an age old tradition and Yvette Stanton captures this in her books and wonderful instructions. In our hot Queensland climate white enhances the feeling of coolness and is an ideal choice in our home decorations. I would love to add this glorious book to my embroidery library. The reason why I would love to win this book is definately its style, then again it could be the photos of the projects, or then again the instructions. I guess then, that it has to be a combination of everything. Thanks for the opportunity to try to win this fabulous book. Oh Mary I simply drooled over this book – I love white on white, love drawn thread and bullion knots, and the book looks so fabulous with all the examples, instructions and patterns. After almost 50 years of working I am finally blessed with the time to pursue my passion of needlework. When I read your article on Portugese Whitework I decided I must purchase this book. I read your column everyday, Mary. It is like receiving a gift everyday that I find it waiting. Thank you for enriching my life. I can’t believe you are giving away this book – it looks stunning. Your book reviews are always amazing and I have often made a purchase purely because of your reviews. Thank you – it is so much easier than just blindly making a purchase based on a brief write up and a picture of the cover of the book. Maybe one day I might actually win something. WOW. The cover and the projects (previous post – esp the ornaments, biscornu) are stunning. I like whitework anyway. The texture in this type of needlework is impressive – would be fun to give smaller projects a try. Awesome book. Congrats to the author! thx for the book review and opportunity to own the book. Hi Mary, *sigh* Another beautiful book full of new techniques and lovely projects. Having spent all of last weekend at ‘quilt camp’ I have discovered how wonderful it is to spend all day stitching & sewing, so I think this book would be wonderful for anyone wanting to learn a new style of embroidery and spending all day/weekend perfecting their style. Hello Mary, I was holding my breath hoping the your give-away would be this book! I am a big fan of Yvette Stanton and have two of her books already. I am so comfortable with her written instruction. I am working hard to build my library of books so that, as long as my eyes can focus and my fingers can work I can be happily immersed in needlework creations. I love whitework of all types and this is beautiful. The pictures are clear and the instructions appear to be easy to understand. I’d say what appeals to me is a combination of everything about the book. I’ve looked at this post several times. I will be looking for this book if my name is not drawn. I absolutely love your website and book reviews. Amazing detail. Just fabulous. All of Portuguese Whitework appeals to me in more ways than one, it reminds me of childhood days sitting around a table with my Portuguese friend and her sisters, we were making a table cloth for the eldest sister who was getting married, and even though it was a simple pattern, the beauty of the white work and pride I had of sharing those moments with them will be with me forever, not forgetting the scrubbing of hands before sitting down to work, their Maema (Mom) keeping a watchful eye, teaching us the stitches, we were 5 around the table 4 sisters and I, we were between the ages of 9 and 16, my friend and I being the youngest, we were taught after to crochet mats for our bottom drawer. Good Memories. Thank you for allowing me to enter your offer and sharing my story with you. Thank you for having this give away. What a beautiful book. I would love to have a try at doing this beautiful work. What an interesting book. The pictures and instructions are very clear. The projects are very achievable and makes traditional whitework look so contemporary. I would love to own this book. A wonderful addition to my small but growing library. All of the visible contents appeal to me. This book reminds me of a combination of hardanger and brazilian embroidery. The projects seem manageable. Thanks for having a give a way. I love whitework, and love learning new needlework techniques, so I would dearly love a copy of this book. Also, I have two other books by Yvette, and know this one will be equally as beautiful and interesting. Thank you, Mary, for the chance to win. Oh, I would LOVE this book. About the past year or so, I’ve been attracted to projects with one or two colors. I’ve noticed my eye being drawn more and more to whitework also and I went crazy when I saw the pictures of the book last week. I would very much like to learn how to do these stitches. The projects in the book were beautiful! Thank you, Mary. I’m intrigued by this book. I love traditional white work techinques and this seems like a very interesting and different take on workingi n white. I´ve been wanting this book ever since you first mentioned it! Guimaraes is just an hour away from where I live so this style of embroidery is close to my heart -I obviously want to try a few of Yvette´s projects! I love white work of all types, including this one! Thank you, Mary, for the give away! Most generous!! I thought the embroidery was crisp and dimensional. It’s beautiful! are wonderful. I love the way it looks. I would love to win this book. Thanks for the chance to win!! What a beautiful book! I have done some drawn thread embroidery and some bullion work too, but the combination of the two in this type of embroidery is just stunning. Just the few photos tempt me to take it up again. Thankyou for bringing to my attention. Achei lindo este livro, como os outros que já vi neste website, pena que eu não tenho oportunidade de adquirir estes livros aqui no Brasil, mas gostaria muito de ganhar este, e espero ter a sorte de ganhar. Amo seu trabalho, obrigada pela oportunidade. I found this lovely book, like others I’ve seen on this website, sorry I do not have the opportunity to purchase these books here in Brazil, but would love to win this, and hopefully be lucky enough to win. Love your work, thank you for the opportunity. Portuguese Whitework is so beautiful. It reminds me of needlework my dear Grandmother did. Wouldn’t I just love to follow in her footstep and learn to do Portuguese Whitework. I’m intrigued by the style of the embroidery… I love to do needlelace, and this looks like it has some similarities to that. It looks like it may be related to hardanger, and that’s been on my list of techniques to learn as well! I think that the white work is beautiful and I would love to try it! Thanks so much for having this giveaway! This looks like a great book. I was drawn to the beautiful projects and the directions look like they are very clear. Mary, I would love to learn cutwork and improve bullion stitches. You provided a great review of the book! Great book!! Hope I win!!! I’m doing hand embroidery as part of my senior collection in school, though it’s a different type of embroidery, but I always love to learn new techniques and the designs in the book. Thank you Mary for such wonderful opportunity! This book looks exquisite. My family is Portuguese but I’m Canadian so I haven’t seen too many examples of Portuguese embroidery in person. My embroidery is self-taught from books and websites (your video tuts are incredible) and I’d love to give this beautiful whitework a go. Oh my Mary! Here we go again. I would love to have this book to learn to do Portuguese Whitework. I am learning to do Italian whitework at the moment and I’m hooked. Imagine combining both of them in a design. I didn’t realize how addicting doing whitework could be. I also have some patterns and directions for Polish whitework (which is Richelieu) to try. Polish whitework is similar to Italian. What a wonderful experence it would be to work the Portuguese whitework too. Boy oh boy what a treasure I would have in my collection with this lovely book. I am making heirlooms for my grdau since I seem to be the only one doing “hand” work any more. Love the amazing look of the embroidery. Have never wanted to attempt it but Yvette’s instructions are so clear and easy to understand so would love to try it before the eyes and fingers give out!Also I love the many different projects to try – from the small to the large.I have her Mountmellic book and if this new one is anything like it, it will be a book I will treasure. Although I have not attempted this exact type of embroidery before, white on white has always been a great favourite and I love the chunky stitching in this particular style. To add this book to my collection would be a wonderful addition and to add this technique to my repertoire would be even more so. Thanks Mary, yet again, for the opportunity. Hi Mary! I LOVE this book. There are so many techniques in it that I would love to try. I have tons of fabric and tons of thread, not sure it’s the right fabric and thread, but it would be something to start with. The projects are gorgeous. Portuguese whitework! How exciting. My maiden name is the name of town across the bay from Lisbon. (like Oakland to San Francisco) So having a book that will teach me the technique of my very own heritage would be the best! So I would say the main attraction is the style of embroidery. I am fascinated with all forms of Drawn thread work & would dearly love to have a copy of this book. It is interesting how the drawn thread technique has travelled & changed over time, so to see how it has been used in this part of Portugal would be so interesting. I already got the book. I just want to put in my comment. No need to put me in the draw. 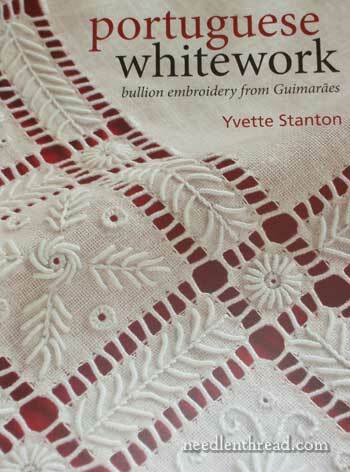 Whitework is elegant and Yvette’s book caught my attention with her book cover, bold and beautiful,white with red in the background. I am a fan of her whitework and I was a bit worried about doing the bullion stitch. So I thought a book all about bullion stitch will get me into a lot of practise. I have faith in Yvette’s instructions as I did her stitch along project through her blog. I am looking forward to learn this technique and put it into my garment. I expect to get the supplies from Yvette soon and will start a project straightaway. Thanks for the wonderfully thorough book review Mary, and for the chance to win this great book! I love the look of whitework and drawn thread embroidery. My favorite thing about this book – the beautiful projects! Thanks again for the daily newsletter – I eagerly await its arrival every morning! I’m fascinated by this style of embroidery and the projects she has included are interesting. This book would be a great addition to anyone’s collection! To me, the most appealing thing is the style of the embroidery. I would really like to try this type of embroidery. I like the white on white and the work in this book is so delicate. I really like it. I LOVE this type of work! It would be fantastic to win the book. This style of embroidery and some of the patterns are what appeal the most to me. It is really beautiful so I would like to learn more about it. Embroidery is the best treatment for stress! I woud love to learn how to do Portuguese Whitework. Mary, I have seen this book and it is indeed well written and illustrated, I enjoy this style of work as I already do Hardanger I would certainly love to learn this particular form of embroidery, so therefore I really hope I am lucky enough to win this particular book. Oh goodie, a give-away! I love all kinds of whitework which is why I really want to add this book to my collection. I like the way Portuguese whitework is both delicate and strong looking at the same time – how cool is that?! My daughter has nudged into commenting on this wonderful book, with a “give it a go mum, you never know” lol. I have loved white work ever since a friend’s grandmother taught me how to do it over 20 years ago. Admittedly time has been sparse lately for sewing but this would be a great incentive to pick it up again. Also I just wanted to say hi from Tasmania, I love your site, tut’s etc, it is firmly placed in my “Favourites bookmarks”. I belong to a whitework group with my local EGA group. We used Yvette Stanton’s Ukrainian Drawn Thread Embroidery book to study Ukrainian whitework. Her book was great as I am sure this one will be. If I do not win this book I will buy it. I love your newsletter/book reviews. The book looks like an immediately invertion. It is a must have book. The cover of the book makes you want to invite your friends for a high tea , it bring you in the mood. Mary thank you for this beautiful give away. I already have 2 books written by Yvette Stanton and they are to die for. Beautiful in every way, text, photos and descriptions she just brings it all to life so well. I would love this one too and am itching to try some of this fascinating work. I love Bullions and I love embroidery books even more.I hope to do at least one project per book but, despite being retired, the projects seem to be piliing up as I can’t stop thumbing through those luscious pages. I just love Yvette Stanton’s other books. I love whitework and really enjoy learning new types of embroidery and drawn thread work. I love you having this book in my collection. The cover of this book turned me on before I even saw the reviews. I have not craved owning a book so much for ages. The whole book, projects, instructions, even the pronunciation of the name really drew me to it. I do not like doing bullions and this might make me enjoy them. Thanks Yvette and Mary for this chance. I’ve never seen this style of embroidery, and think the ladies in our local stitching group would love it and it looks like the book would be a great starting point for us to try it. I love whitework, and this is a technique I’d like to learn. It interests me too since my husband has Portuguese roots. And I do enjoy making bullion knots! So I think this book would be right up my alley and winning it would be a great treat! O que mais gosto do Livro??? gostei do pouco que vi do livro, da capa do livro…. enfim de tudo e ainda pelo fato de explicar como se faz o bordado e dos projetos que o acompanham…. obrigada pela possibilidade de participar do sorteio…..
Everything about this book appeals – any kind of whitework is irresistable! I’ve seen some of Yvette’s other books and have found her instructions to be spot on. First of all I have other Yvette’s book on my own – Hardanger Embroidery – and it is just very well written. So I’m sure that this new book will be perfect for learning with clear instructions and variety of patterns to choose from. The photos look great and I would be very happy to learn this embroidery. Well, if I don’t win it I’m pretty sure I’ll buy it anyway :). White on white has a beauty of its own. I have done a lot of bullion stitching, but not really Portuguese whitework. This seems such a lovely book to have as your own. Would love to win it! I loved reading all about the book and think it would be east to follow. My 86 year old mother is a wiz at embroidery and she also does Viana do Castelo which is another type of Portuguese embroidery. She also does a lot of drawn thead work, so did my gran. I have every intension of buying this book for her and perhaps one for me. So I am just hoping I will one of them. I think I’m attracted to all three, but especially the style and instruction. I’m just learning Dresden Lace, and would love to learn Schwalm, too. I know they are related a little. I’m Portuguese and believe me it’s not easy to find books about Portuguese embroidery. I even work at a book store and we don’t have a single book about it. I would really like this book because besides the instructions of how to do it, it has information about the history of this kind of embroidery. Oooh, I would love to win this book! It looks gorgeous, and I really love whitework. Also, I used to live in Portugal, so I have a special affinity to portuguese craft, especially embroidery. I am now trying my hand at Castelo Branco embroidery, which is very colorful, and after finishing my current project, it would make a nice change to do some whitework again… So I hope I get lucky this time! This book appeals to me after reading Mary’s review of it. I love whitework but have never tried this type. I know Yvette Stanton is a good authority to learn from when beginning a new technique. Achei o livro lindo. Meus pais eram Portugueses, do norte de Portugal, e a muito tempo procuro livros que me ensinassem os Bordados de Guimarães, com fio de Ouro, mas aquino Brasil não se acha nada sobre o assunto. Preciso demais dessa pérola de livro. Ever since I can remember, I have been drawn to the beauty of whitework but never thought it would be something I could do. This book, with it’s clear instructions, might just make a whitework stitcher out of me yet. I love all the information shown in the book. I especially like the instructional part of learning easier and new techniques. The book is lovely. You are precious to give us novice viewers a chance to win such a valuable book. Thanks! Its EVERYTHING about whitework. But especially, I’d choose the projects, the patterns, the careful instructions and tips and techniques. Thank you Mary and Vetty Creations for your generosity. It would be MARVELLOUS to own this. I loved this book. The pictures of the white work were beautiful. I thought if I had this book with the instructions, I might actually be able to do the small square mat. This always looked so intimidating, but with a guide like this, I’d give it a try. Wow, what a gift to win! I love making bullion stitches, I love whitework and I love pulled thread. I still learning these and when I saw this book I was captured. I love also the historical aspect in the book and am thrilled that people are making efforts to preserve and present these ancient embroideries for future generations. Plus of course, the step by step and projects! I have been thinking of doing a baptismal gown with whitework and pulled thread and this would be the perfect inspiration. looking at the price I knew I would have to put it down as a “future, distant” purchase. so it is great to have a chance to win this. I would love this book because it reminds me of all the white-work doilies my mother had under her knick-knacks in the china cabinet. When she’d change them out she’d tell me who made it, and what kind of embroidery it was. My favorite has always been white-on-on white cutwork. This book would help me to replicate those designs. I’d love to win this book. I am attracted by the photos. The detail in the whitework from using the combination of drawn thread and surface is something I’d love to do. I’d probably work one project in the book, then do a self-designed project using Yvette’s techniques. A group of us started a whitework association. We meet regularly to work on projects. We discovered that there are a lot of whitework techniques! This is a new one to me. It would be great to have the book to introduce this type of work to the group so they can get a copy if they want to try it. Yvette Stanton’s books are always excellent. This book looks great and thanks for the review and winning opportunity Mary.I love Yvette’s books.She explains a technique clearly and precisely,her photos also helps me to learn a technique better.I’d like to win this book because I love whitework and am attracted to this technique where there are lots of bullions involved.The patterns are a bonus. This looks like a great book – I love white on white embroidery and do quite a bit of it. In fact, just finishing a ring bearer’s pillow for my daughter’s wedding. I would love to learn this style! I really would like this book. Everything about it is beautiful. I just started doing Portuguese bullions from another book and its patterns. This book seems very colorful. Every little bit helps. Oh, Mary, what a wonderful & generous opportunity. Thank you, thank you, thank you!!! I’ve got this & several of Vetty’s books on my wish list. I am very intrigued by this style of stitching. It is soooo beautiful. Most of all I know that Vetty’s instructions are excellent. I can’t get over the beautiful pictures in the book! So many projects I’d love to try. It would be a great book to add to my library! Beautiful work. I am so inspired by all the lovely hand embroidery projects. I love to just look at them. I would like to learn more about the cut work, hardanger and whitework side of embroidery, and in this book there are some absolutely beautifulprojects I would love to try. Thank you for sharing this beautiful book with us, Mary! I love everything about this book, but there is something special about white on white embroidery. It’s truly elegant and reminds me of the work my grandmother did. Hopefully, this book will be added to my embroidery library and thank-you very much for offering this opportunity to your blog readers. Hugs. The projects look so interesting but the photography is wonderful. The sampler project is the most interesting to learn a new technique. After a house fire last month (aka 3/4 of the contents) a new book, a new project, learning something new, would all be refreshing. Since I already own 3 other books by Yvette, I love her books and find her instructions and photos very clear and easy to follow. The embroidery in her new book intrigues me and I’d definitely love to learn this type of embroidery. Not sure if I would do the large tablecloth but many of the other projects are doable for sure. I love the raised texture of the stitches and white on white is one of my favorite styles. This book is the ultimate in eyecandy for me. I would love to try Portuguese Whitework. The pulled thread, the needle wraps, the bullions. . . everything about it appeals to me. The inclusion of projects, pictures and the “how-tos” are important for a first time attempt. Thanks for including this book in your give-away. Not to be ‘cheating’ by having 2 entries, but after entering, seeing all the comments by needle lovers, I think our LOVE of the work and the beauty will not allow our art and skill to die!!!!!! THAT IS SO EXCITING TO ME! In the ignorance of my youth, I made pillowcases embroidered with roses made of bullions. I say ignorance because I didn’t know bullions were supposed to be hard to make. That was decades ago & I’m ready to do them again. I love all types of whitework, but the Portuguese Whitework with its raised look is exceptionally lovely. The book is interesting to me because of the presentation of a new technique to try and because of several of the projects you pictured in your review. If I don’t win it, I will certainly buy it! I am interested in this book because of my long interest in whitework. I am not familiar with Portuguese work and would like to learn more about it. I also am interested because of the instruction and patterns included in the book and because I need to improve my ability to stitch these kinds of stitches. This looks like the perfect book for me to add significantly to my interest in whitework. I’m always interested in learning or improving an embroidery stitch/style and the chance to incorporate it in a new technique is a bonus! I’d love to be able to add this book to my growing collection of “Inspirational” Needlework manuals! What is there NOT to like about this book. Whitework, bullions, beautiful photographs, clear instructions, patterns, inspiration – the list is endless. Thanks for the chance to win it. This book is beautiful! I want it because everything about it appeals to me. I love the look Portugese Whitework and Mary’s review has me wishing to get a copy. Thank you for opportunity to win it! It would be great to have as a resource I am just starting to choose books for my library and can’t wait to add this one…I love everything about it. What appeals to me most – white, white, white!! Oops, does that count as three things? Either way, this book is on my wish list and it would be a supreme treat to win a copy…thanks, as always, for your great giveaways Mary. I would love to start doing whitework, and I’d also love to have the detailed bullion instructions–I do a lot of bullion embroidery, but that doesn’t mean I’m great at it yet. I think the style of embroidery is very pretty and the instructions sound very detailed. I’m also attracted by all the projects, and I think it’s great that there are lots of small projects since those are the ones I’m mostly likely to tackle. I’d love to stitch the sampler and that biscornu looks lovely! I love whitework! I would like to create a tea cloth or something similar from the projects in the book. I’m soing embroidery since 2000, and I love learning all kinds of embroidery, specialy ones from other cultur. What I love about this book, is everything; instructions, projects and the fact that there is lots of photos. If I don’t win it, I will certainly pruchase it. I love everything that appears in the book, the instructions, the pictures, the proyects,. ……EVERYTHING!!!!!! This book brings to my senses the smell of portuguese baked goods; the song “cheira bem, cheira a Lisboa” among the happy memories from my five-year residence in Portugal and all the walks I took discovering this beautiful country and its regal people. I lived in Portugal for five years many years ago, and although I purchased many Guimaraes pieces, I regret I did not learn to do this work then. Love white thwork and the projects in the book are beautiful. Thanks for the opp to win it in the giveaway. Beautiful and elegant! A delight for the eyes. I was intrigued with the simplicity and depth of her designs. Also, the purity of the white on white that gave me a feeling of contentment and stability; like going to grandmother’s house. This book looks to be a comprehensive guide into Portugese Whitework with detailed charts of technique and advice. I am especially curious as to the additional designs Ms. Stanton has created. Certainly a book to be added to my wish list. Thank you for sharing the sweet eye candy and leading me to a talented artist! I’ve never met a piece of whitework I didn’t like! What a lovely book with which to learn a new technique! I think I would enjoy all aspects of the book: clear instruction, inspiring photographs, a variety of projects, and the history. Thank you, Mary, for a chance to win! And thank you,Yvette, for all your hard work! I would love to win this due to the exquisite examples, color, history, and patterns for the projects. It looks like a wonderful book to learn from. I’ve been looking for a book to learn whitework and this one looks fascinating. I’ve interested because it sounds like it shows how as well as projects and ideas. Wow, what a masterpiece. I have always been intrigued by this kind of work and having recently aquired linen that is nearly 100 years old detailing this work I have become inspired to try my own. I like that the book has the usual step by step guides but I am impressed the most by the patterns in the back and the side by side guide to choosing the colours of the thread by the brand. Living in Australia you cannot always obtain the brands mentioned in the books so this guide really caught my eye. I liked your book’s review and I’m very curious about it. I’m portuguese but I have to be honnest and say that althought I know guimarães embroidery I never try the thecnique. Also it’s great to know that a portuguese heritage is being feature this way; thanks for the chance to win! I would like to have this book in my library because I love the look of white-on-white embroidery. I have tried some other styles of whitework, such as Schwalm and Richleau work, and could use this book to try another technique. Thank you for this opportunity. I have a library shelf that is called really need to try this. The projects in this book look interesting and you make is seem like we out here can do anything. My bucket list for life holds ideas of every embroidery technique I want to try. Mary, thanks for this wonderful website and for the inspiration to give us each day. Me encanto la revision del libro, y mas me gusto que enseña paso a paso el como hacer este tipo de bordado. Lindo!! This is beautiful technique, I have never seen it before. I love all types of lacework and whitework with lace effect, and I would really like to try this one. I appreciate good instructions in this book, various examples, and projects. Thank you Mary, for review. I put it on my wish list. What appeals to me most about this book is the comprehensive instruction, the style of embroidery and the history of the style. I love reading about how styles evolved within certain cultures. It provides something to think about while I’m working the embroidery. The book and projects look and sound so pretty! I would love to own it.Thanks Mary. I have always been attracted to whitework of any kind. The pictures in this book are incredible! I would love to try and reproduce one of the beautiful table runners. Happy Hump Day Mary! I love the look of bullion and would love to win this book for all of the reasons listed. I too like Yvette Stanton’s books and was looking forward to seeing this one but with the little preview in you review am really looking forward to it. I love the way she combines the old skills with modern ideas for applying them. I love whitework, have done Schwalmer, Marker, drawn work, pulled work. This portuguese work looks marvellous, I would like a try on it. The design ideas and presentation has intrigued me the most. The Portuguese Whitework is lovely. I also do Brazilian embroidery which uses the bullion stitch. I like learning new techniques and using stitches I’m alreqady familiar with. I would love to have the book!! To me the most appealing thing about the book is the beautiful projects. I would love to learn to do similar work. I have followed Yvette’s blog for some time and have been thrilled to watch the progress of the Portuguese Whitework book. I would love to own a copy, I am very much drawn to whitework and would love to explore this particular technique. Also her instructions are so good, I would imagine anyone could achieve success! Love to add it to the list that I offer. What I like about this book are all the bullion knots–one of my favorite stitches. I love all forms of white work it looks so beautiful.I would love to have this book. Thank you for this give away. Thank you so much. White work is always gorgeous; I always loved white table runners and mats and wondered if I can create one like that. I think this is the right book to get started. Definitely I am going buy one if I don’t win. I love books! I love embroidery! And I love books about embroidery and would love to own this one—hopefully win it. Thank you for all the time you give to us, Mary. Hi Mary, I just loved this book, and I look forward to reading your email every day. I would like to try something different than my normal stitching and this book looks like it might inspire me. I love everything about this book! Chances to learn new techniques and the history behind them always interests me. The delicate whitework with the bullions is lovely! I just love the clean look of whitework. I am attracted yo this style of embroidery and would love to try it. Stunning stunning work, Being Portuguese I’ve had the opportuni to see it personally. Thank you for such a beautiful giveaway! I think everything about it appeals to me. I have been wanting to branch out and learn more stitches. this looks like the perfect book for doing so. I love white work of all kinds and I find ethnic white work the most interesting. I love, love, LOVE whitework. So, I am interested in the book for the instructions and the projects. And, especially interested for the inspiring photos! Having just finished up a Schwalm embroidery project, I’ve rediscovered my love of whitework. I can’t wait to try yet another technique, and the projects in this book look lovely! I would be delighted to receive your book on Portugese Whitework. I do a variety of different embroidery types, so I would enjoy the smaller projects and the instructions. I always love trying new [to me] types of embroidery. Thank you for this opportunity. I am attracted to the style of embroidery (clear visual instructions also help). I’m always on the lookout for decoration styles that’ll really enhance the clothes I have in mind to make. The style in this book looks like it would be awesome on a chemise dress I have planned. The thing I love most about the book is the instructions. It is like having a teacher sitting beside me guiding me along the way. It looks as though there are beginner projects and then more advanced projects to try after some practice. Whitework (pulled and drawn thread) is my favourite stitching technique and Portuguese Whitework looks stunning. I would love to learn how to do it. I just love your book reviews & especially your book giveaways, which I discovered a few months ago. There are three things that really appeal to me about this book. Firstly, I love,love,love whitework, and especially a combination of cut & drawn threadwork and surface stitchery. Secondly, the history of embroidery is always a fascination to me. Lastly, I know that Yvette’s book will be great technically from her previous books. What more could you want… a variation of a favourite style, history and technique. Absolutely beautiful! My favorite embroidery techniques are drawn thread and whitework; I’ve been working with a combination for many years, but this Portuguese work is wonderful! I see myself easily exploring the techniques presented, particularly building my skills with bullion work. I very much enjoy making ornaments — easy to share with others; however, I also see myself working these techniques into the liturgical linens and tectiles I make for the church. Again, absolutely beautiful! I am anxious to peruse this book. I am always looking for new ethnic needlearts and have not seen this style prior to this publication. Whitework is one of my favorite techniques. And, who of us doesn’t look forward to accumulating some additional necessary stash to try a new technique!! From what I have read, the fiber used to form the bullion knots is a little different?! Gotta try it out! This is a type of embroidery I have not yet tried. This book makes it look interesting and I’d love to try it. I’d love this book; the layout looks good, the projects are intriguing, and the theory looks interesting. I’m always looking to learn more! Next Next post: There Ain’t Nothin’ Like Linen!